This Version of GiD Does not have USB Licence. This Version of GiD Does not have Floating Licence. Note: Not every USB memory stick can be used to register GiD. Generally only those with the ‘Designed for Microsoft Windows’ logo are compatible with GiD. Prior to get a permanent password for your USB memory stick, we recommend you to test your USB memory stick with a one month password just to ensure the correct intereaction between GiD and your USB memory stick. Download and install PasServer on the server machine. Run Passerver-conf, connect with the server, and press the ‘Add program’ button to know your server sysinfo. With the licence returned by CIMNE and your ‘Server sysinfo’ fill in the form below . . .
And you’ll get the information to fill in the PasServer ‘Register program’ window. GiD client machines must use the server IP instead a password, then the server machine will provide the floating password. Enter the Help menu in the Menu Bar of GiD and activate the Register menu item. 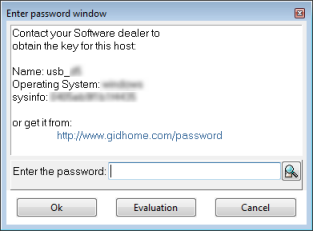 If you have an USB compatible with GiD connected to the computer, the following window will appear, you must choose “Local machine” sysinfo. A window like this will appear. Use the information displayed in the GiD password dialog box to fill out the form below. The GiD password will be displayed immediately after pressing the Send button. If you don’t get the previous window, your USB isn’t compatible with GiD, check here for a list of some valid and invalid USB devices. 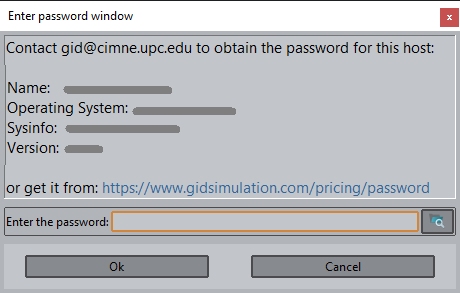 Use the information displayed in the GiD password dialog box to fill out the form below. The one month GiD password will be displayed immediately after pressing the Send button. This page is not in the new format you still can acces to the old page here. Statistical information its required for one month password and optional for permanent password. Fill with “No answer/don’t know” all unanswered questions.